With a total length of only 102 mm (4 inches) and given its very active nature, this tiny avian dynamo is very tough to capture well. This intimate portrait I got way back in 2005 at Tiaong, Quezon, was more of a lucky shot, considering the slow shutter speed used. I probably pressed the shutter button just at the moment when the bird was in between motions. The DOF at nearly 700 mm focal length, f/5.6 and close focusing distance was very thin, and I'm glad I managed somehow to focus precisely at the eye area of the active subject. 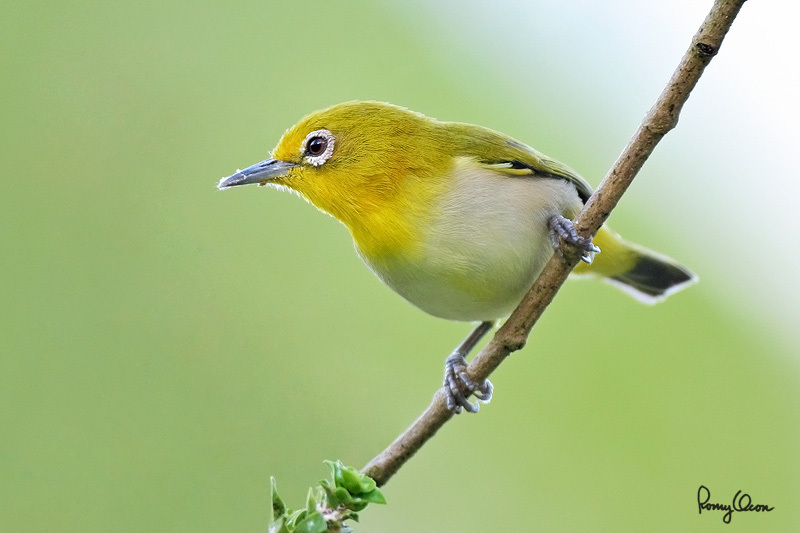 The Lowland White-eye is common in lowland second growth, scrub and gardens. It ranges in Luzon and Batanes group of islands. It is found mainly in the Philippines. Habitat - second growth, scrubs and gardens. Shooting info – Tiaong, Quezon, Philippines, November 27, 2005, Canon 350D + Sigmonster (Sigma 300-800 DG), 687 mm, 1/60 sec, f/5.6, ISO 400, 475B/3421 support, some tiny branchlets in the background were removed to improve aesthetics. Footage of preening Lowland White-eyes filmed in La Union in 2011.